This is just a FABULOUS toy! Our bigger beaks LOVE the original Triangle Teaser and now there's a version for those smaller beaks in your life! Geometrically shaped 1" x 1/2" rectangles of 1/4" thick pieces of soft, chewy wood with a dozen colorful triangle pieces (3" long and 1" wide at the widest part) are just perfect for snipping off the tips. It's all strung on a nickel plated chain with pear shaped quick links on both sides (save the materials and restring with other goodies)! Get creative! Use it as a bridge, hang it vertically, horizontally ... it's a terrific new toy from Super Bird Creations! 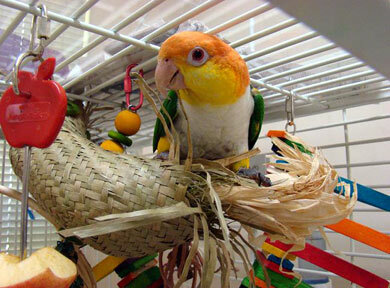 Caique, Chickie is using Rooster Cogbird as a perch while enjoying some of the tail feathers! Too funny! You can see the mini tri teaser in the background, also nibbled on! Thanks for sharing, Saroj, Chickie is a real cutie! For those big beaks in your life, be sure to check out the original Triangle Teaser!